Stewart Garden, the gardening products division of UK manufacturer, Stewart, has seen sales in its electric propagators increase by almost 30% in the last year. This growth coincides with an increase of over 40% across the company’s full propagator product range, reflecting the upsurge in popularity of grow your own. Independent research commissioned by Stewart suggests that keen gardeners under 35 are driving the grow your own movement. Nearly 30% of the money spent by respondents in this age group goes on seeds, propagation, pots and hanging baskets. The Stewart Kitchen Garden collection, launched in 2013, is ideal for the novice gardener. Essentially a mini greenhouse, a propagator is a vital gardening tool. The electric models manufactured by Stewart Garden enable gardeners to set and maintain the temperature required to grow a wide range of plants from seed. 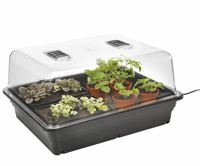 The full range can be found at http://www.stewart-garden.co.uk/14-premium-propagators. Studies show that children are confused about how food is produced. Only 19% of five to eight year-olds know that potatoes grow underground, with 10% believing they grow on bushes or trees. Grow your own can raise awareness of where food comes from to how it reaches our plates. Stewart Garden supports this educational process by providing tools to produce fresh fruit and vegetables. Growing produce brings families together and keeps children active with hands-on activity. Grow your own also exposes young people to vibrant colours and new textures as they nurture their produce. With the increasing popularity of grow your own and concerns about seasonal eating, shopping bills and the environment, Stewart Garden’s commitment to the gardening sector is stronger than ever. The company has major investments in new technology, new products and expanded merchandising and POS support for retailers planned. Stewart also works closely with the Carbon Trust to maintain high levels of efficiency and social responsibility.